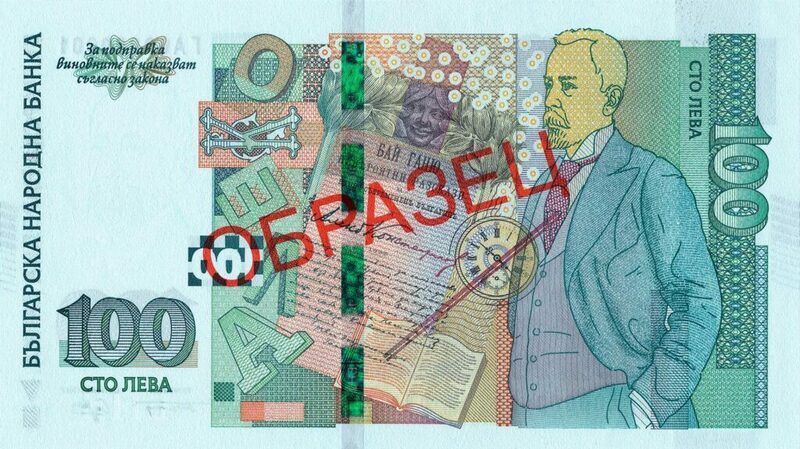 The Bulgarian 100 Levs note won the award for Regional Banknote of the Year at the High Security Printing EMEA in Malta. The award recognizes “outstanding achievements in the design, technical sophistication and security of a banknote or banknote series”. The banknote won the award for its “brilliant, beautiful and dynamic security features which correspond perfectly with each other and encourage the public to authenticate the note at first sight.” The paper-embedded security features – the thread, the foil and the watermark – were supplied by Louisenthal, a subsidiary of Giesecke+Devrient Currency Technology GmbH. The 100 Levs banknote is equipped with tactile features for the visually impaired: five thick and six thin diagonal lines along the margins on the front side. Photo: Louisenthal. 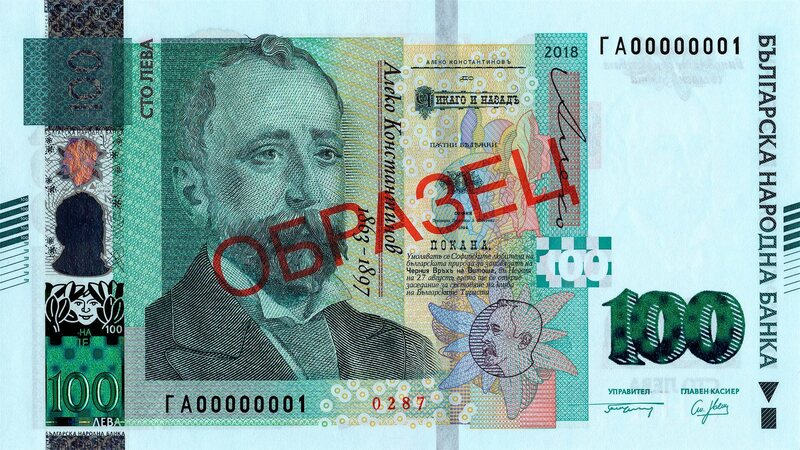 The 100 Levs is the first banknote issued from the new Bulgarian series; it was put into circulation on December 28, 2018 and portrays Aleko Konstantinov, a Bulgarian writer, publicist, lawyer, translator, democrat, and social activist. 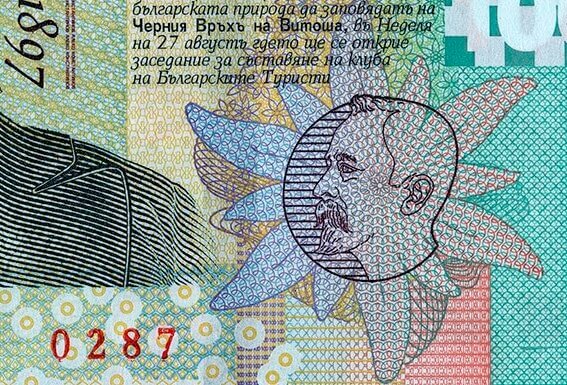 All banknotes in the Bulgarian series will be equipped with the latest state-of-the-art security features. Both the obverse and reverse of the 100 Levs banknote are dedicate to the life and work of Aleko Konstantinov. Photo: Louisenthal. The back of the note features a RollingStar® security thread with the same dynamic chess effect and again with a colour shift from emerald green to sapphire blue when tilting the banknote. The micro text “BNB 100” is visible on either side. The note also contains paper-embedded security fibres: new tri-coloured security fibres in white, green, red are visible under UV light. A three-dimensional watermark portrait of Aleko Konstantinov combined with the highlight inscription “BNB” is visible on both sides in transmission view. Communicating security features: The motif of the portrait of Aleko Konstantinov has been used in the intaglio print, in the watermark and in the RollingStar® LEAD stripe. The repetition of motifs makes it easy for the untrained consumer to verify the authenticity of the banknote. More information about the Giesecke+Devrient Currency Technology GmbH is available online. In 2017, a street in Chicago was named after Aleko Konstantinov in honor of his influential work To Chicago and Back, which was published in 1894. If you’re also interested in Bulgarian coinage and monetary history, we recommend you read Vladimir Ovtcharov’s “Coinage and Coin Circulation on the Balkans” and Konstantin Dochev’s “The coins of the Byzantine Palaeologos Family in the coin circulation of the Bulgarian Kingdom in period 1259-1396”. In 2018, Giesecke+Devrient already won the “Regional Banknote of the Year” Award for the Armenian 500 dram collector’s note.